If you have a big home or a small home, you might like to consider an additional loft storage space. Most people use their garage as storage. The problem with this, is often there isn’t much space left for the car ! Loft storage is an excellent option. If you want to use your loft as a storage space you will need a way to get up there safely. 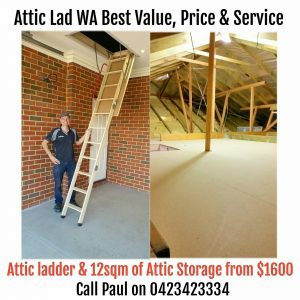 Having a loft ladder installed by Attic Lad WA will give you a safe and easy access to the potential storage space in your roof. A hand rail can also be installed at the top to facilitate your movement up the loft ladder. Lofts can be hard areas to move around in. Having part of your loft turned into a dedicated storage space makes sense. 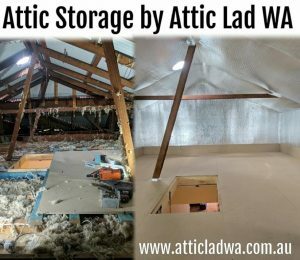 Attic Lad WA specialises in creating affordable loft storage. The first is a basic loft storage platform. The second option is a dust proof loft room. This is a good storage option as your belongings will be stored in a dust free safe environment. When creating loft storage space in your roof Attic lad always selects an area within the loft that is close to the point of entry. So that you avoid getting yourself into unsafe areas. Having a dust proof loft room which is built out of a 3 in 1 thermal radiant insulation barrier, minimises heat loss or gain. It does that by supplying an obstruction between the loft room and the rest of the roof space that experience different temperatures. So this will not only preserve your items but also regulate the temperature of your dust proof loft room in all seasons. The Materials Attic Lad uses to build the dust proof rooms, offers excellent insulation which helps to keep the heat out of the dust proof loft room. Ventilation in your loft is very important! Attic venting is a good thing for most houses, and having too much venting will not harm the structure. Airflow promotes cooling and drying. For any dust proof loft venting to work properly, you have to have air flow in and air flow out. Having a ducted vent from the eves into the dust proof room is important as the whirlybird vent can become an outlet for trapped hot air which will be driven out by the stack effect. This will also help to stop condensation and moisture problems too. 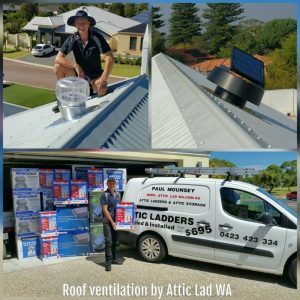 Installing a ducted eves vent into a dust proof attic room will help air to continually enter the dust proof Attic room. Any trapped heat in the room to be vented out through the Turbobeam whirlybird installed on the roof. When a ducted eves vent is installed with a Whirlybird, air moves upwards due to the stack effect.